From a 100% food grade silicone storage bag to an ergonomically designed biodegradable bamboo and corn starch dish set, these are the best selling baby and children’s feeding products available from The Tot. As parents we tend to focus a lot on what we feed our kids, but not as much on what we serve their food on and in. While it’s one thing to want your child to eat their vegetables, it’s also important to be aware that many plastic plates and bowls on the market can leach toxic chemicals into your child’s food when heated. With soft plastics and disposable packet food posing a risk to the environment, we’ve also focused on finding safe, clean, sustainable, eco-friendly and most importantly – practical – feeding products for your tot. 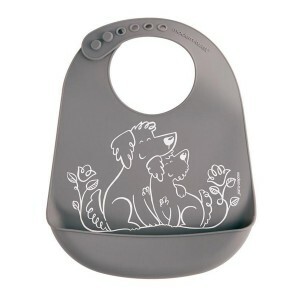 Modern Twist’s non-toxic 100% FDA approved food grade silicone bib is designed to catch every bite of food your tot’s little mouth will inevitably miss. Not to worry, simply give it a quick rinse and you’re good to go again and again. Practice makes perfect, right? 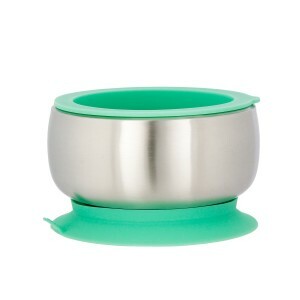 Free from nasties like BPA, PVC, lead and phthalates, Avanchy’s environmentally friendly stainless steal and silicone bowl/ lid set suctions to any hard surface making it perfect for little hands still interested in exploring their food instead of eating it! Re-Play Snack Stacks have been best sellers for years and it’s no wonder why. 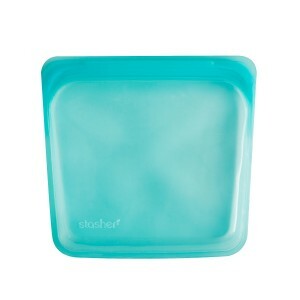 Made from recycled milk jugs in the USA, they’re dishwasher safe and easy to store snacks, toiletries, toys and more in. 100% plastic free and shatterproof, the Pura Sippy Bottle is perfect for little sippers and chronic tippers. 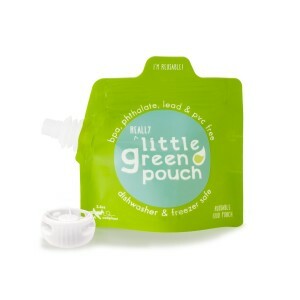 Designed with a non-toxic food grade silicone straw, it’s non-toxic, easy to clean and a diaper bag must-have. A great gift idea for first birthdays, the Miniware Dish Set is just the thing you need to start encouraging independent feeding. 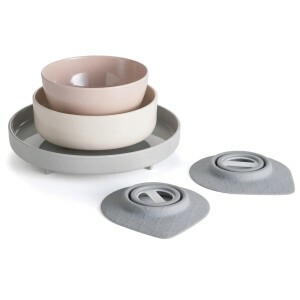 Made from 100% non-toxic and biodegradable bamboo, the set comes with silicone suctions to keep your tot’s food on the table and off the floor. 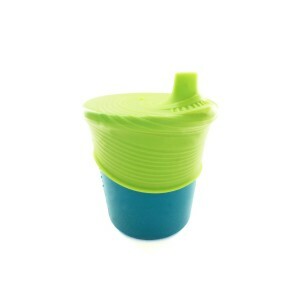 The Silikids Siliskin Sippy Cup is genius for a lot of reasons. Completely non-toxic and virtually indestructible, the stretchy silicone lid can work with cups of multiple sizes making it versatile as well as easy and safe to drink from. 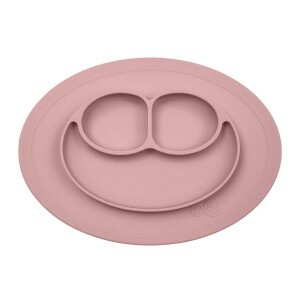 The EZPZ Mini Mat is a placemat and divided bowl in one! 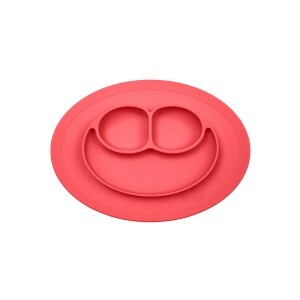 Made from 100% food-grade silicone that’s completely non-toxic, this mat is dishwasher, freezer and even oven safe. 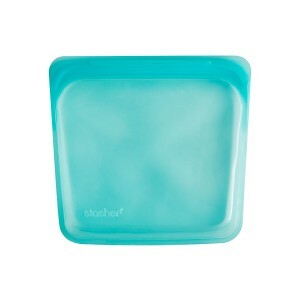 Great for meal prepping, storing leftovers and even sous-vide cooking, Stasher Silicone Bags are made of food-grade silicone, are easy to clean and a great alternative to soft plastic storage bags. While pre-packaged pureed food can literally save the day, it’s not always the best option in terms of our health and environment. 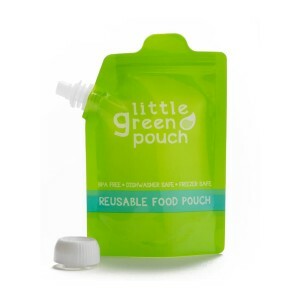 The Little Green Sprout Reusable Food Pouch is a great alternative to single use pouches. Easy to clean and good for up to 50 uses, your tot will love sucking down your home made special while out and about! When it comes to glass bottles, the German-made Hevea Glass bottle is our go-to. 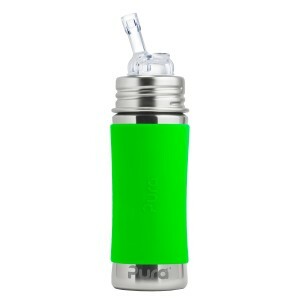 Made of 100% borosilicate glass, its smooth and non-porous surface doesn’t leach toxic chemicals and is extremely durable.